Hareidi MKs say it’s discrimination to require hareidi scholars to enlist in the IDF without demanding the same of Israeli Arabs. “Equal share in the burden” of army enlistment is meaningless if it does not include Arab citizens, representatives from the hareidi-religious Yahadut Hatorah (United Torah Judaism) party argued Tuesday evening in a meeting with Likud Beytenu. “If there is ‘equality’ – then let it be true equality. Why is the hareidi population under pressure while the Arabs are outside the debate completely?” challenged MK Moshe Gafni, who was quoted by the hareidi paper Hamevaser. MK Meir Porush argued that the state has not historically been eager to enlist even those hareidi men who were eligible for mandatory service. The Tal Law provided an automatic deferral of IDF service to men learning Torah full-time. 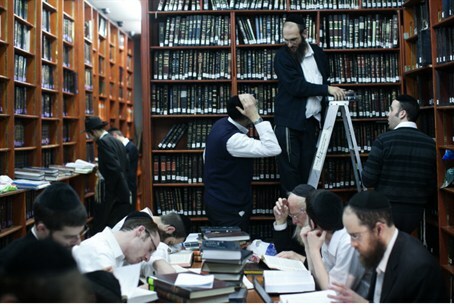 Hareidi men who left Torah study in favor of higher education or work would have been obligated to enlist under the law. The focus on hareidi enlistment while Arabs are not obligated to perform any kind of national service proves that calls for an “equal share in the burden” are mere “populism,” the hareidi MKs charged. Toward the end of the meeting with Likud, the Yahadut Hatorah representatives turned the conversation toward education. The party is demanding complete independence for the hareidi school system, which would allow schools to continue to receive partial government funding without teaching “core curriculum” topics such as math and English. Likud representatives said the matter would be discussed in a future meeting. This is, after all, the viewpoint of Yisrael Beyteinu's MK David Rotem, in his proposed draft law and in a recent interview with Arutz Sheva.